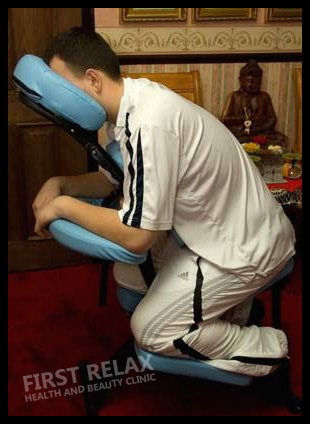 Modern day Seated Acupressure, also referred to as on-site or chair massage, is a hybrid of the ancient Oriental massage arts of Anma and Shiatsu. Seated Acupressure is a meridian based therapy in which thumb, finger, elbow and knuckle pressures are used to stimulate many of the acupressure points on the 12 major meridians accessible on the back, arms, hands, neck, head and legs. This press and release technique helps to stimulate and balance the flow of energy or life-force throughout the body. In turn this stimulates the circulatory, muscular, nervous, immune and lymphatic systems and promotes the release of endorphins and important mood-regulating neurotransmitters, leaving the client feeling good in a relaxed, but energised and clearly focused frame of mind. Traditionally, the basic sequence that is taught today lasts no more than 30 minutes, which makes Seated Acupressure the ideal modality for the busy workplace environment where employees benefit from this quick, dynamic de-stressing therapy and can return to their desks buzzing with energy. The clever, ergonomic design of an easily portable chair completely supports the client’s body in total comfort, allowing the practitioner easy access to the client’s acupressure points without removal of clothing or the use of oils. As a result, in many of today’s busiest environments such as airports, shopping malls, spas and fitness centres, seated acupressure practitioners can be found practicing their fluid, choreographed sequence or ‘kata’ on a grateful and willing public. Throughout the last decade, increasing numbers of people have benefited from this amazingly effective therapy which is arguably, one of the fastest growing in the Complementary Therapy Industry.